In Regional Nature park below the Vercors. Traditional 'bastide' (country cottage) which has retained its rural charm subtly combined with excellent modern comforts and quality interior dÃ©cor. Rest and relax in this beautiful and peaceful setting. In open countryside yet close to shops/services, it's the perfect departure point for a wide range of activities and for exploring the area. Many walking/hiking trails all around. 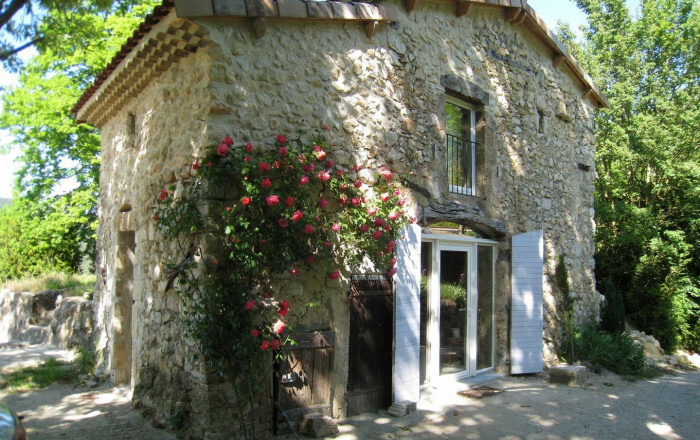 La Bergerie is a detached holiday cottage with lovely original stone walls. Ground floor: living room with open-plan kitchen and lounge areas (fireplace), separate WC (wash-hand basin). 1st floor: 2 bedrooms (queen-size bed, terrace) (2 single beds), shower room, WC. Bed & household linen pack: 80â‚¬.